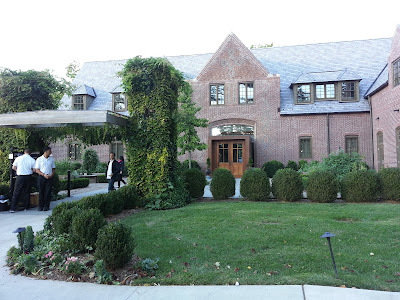 My mother and I are huge fans of Blue Hill at Stone Barns. 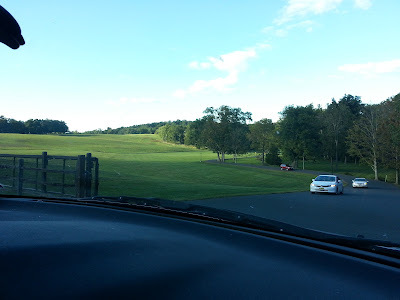 As we were getting ready to plan our annual mother-daughter excursion to Blue Hill this year, Piggy KL mentioned that there was a place in New Jersey called Ninety Acres that was suppose to be similar to Blue Hill. With my curiosity peaked, I looked it up and saw that it was only 20 minutes away from my mom's place. How can it be that its so close yet we never knew??? 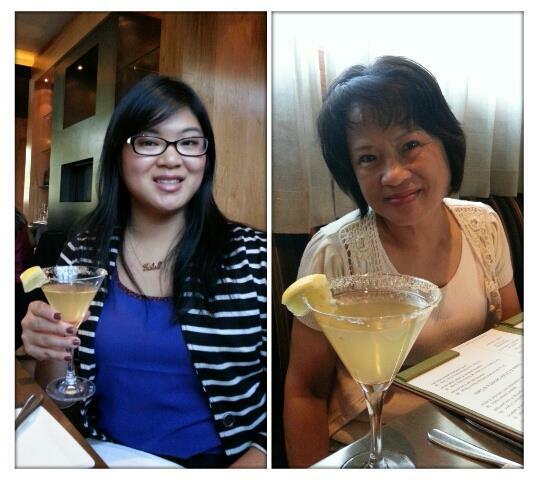 So my mom and I decided to push Blue Hill to next year and give Ninety Acres a try! 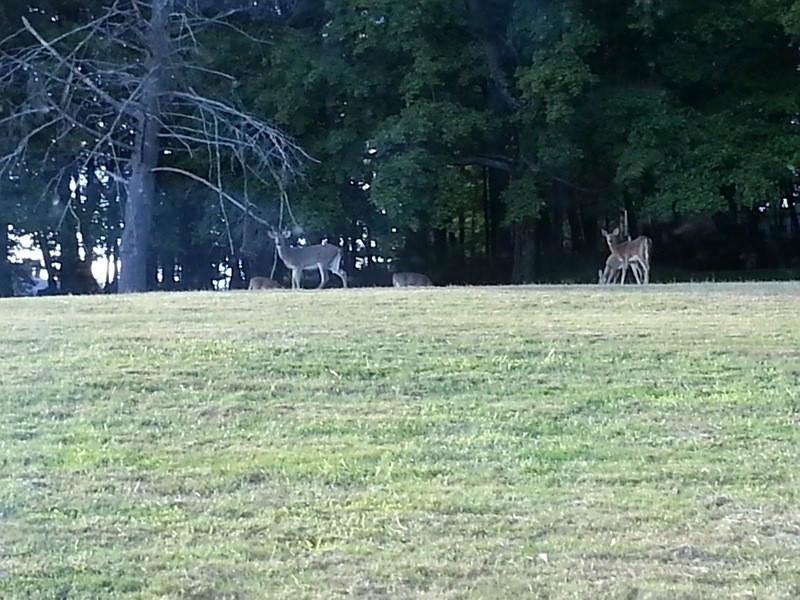 Located on a 400+ acre park named Natirar (thats Raritan spelled backwards! 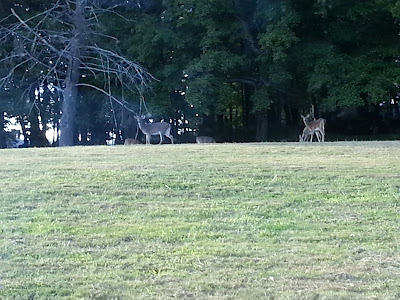 ), Ninety Acres is just a stone's throw away from the Bridgewater/Basking Ridge area. The whole 400+ acre space was sold by the King of Morocco in 2003 to Somerset County, who then leased approximately 90 acres to Sir Richard Branson of Virgin Group fame (thanks wiki for the history lesson!). He has developed the main mansion into an event space and the stable/carriage area into the restaurant and culinary school. 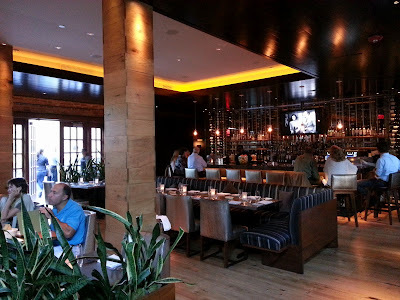 There are three seating options at Ninety Acres: main dining room/bar seating, "Bring Me Food" seating, and the Cognac room/outdoor seating. 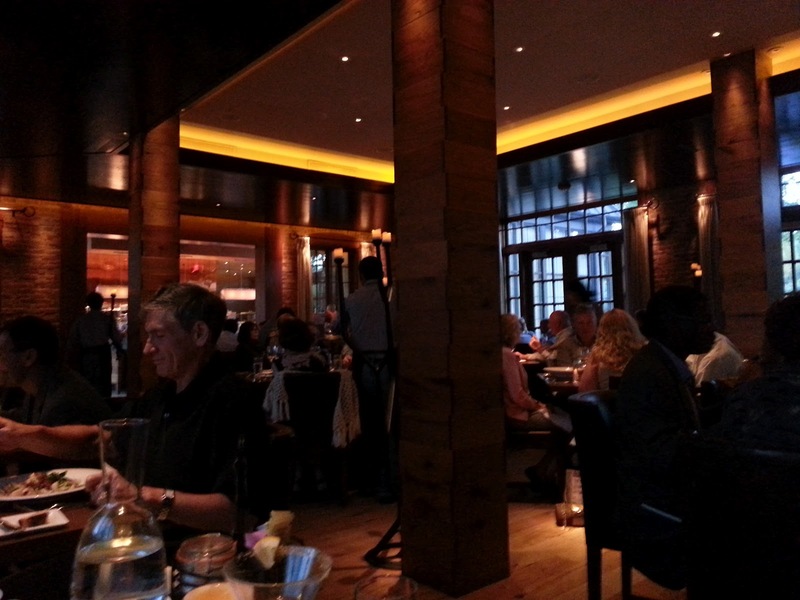 The main dining room and bar dining area both serve their a la carte menu. 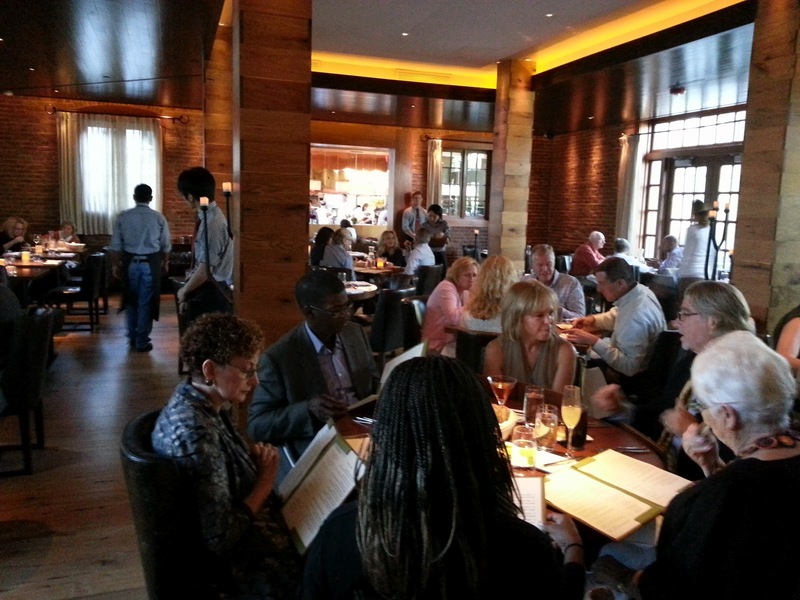 For those of you making reservations online and/or on opentable.com, those spots are for the main dining room. Reservations for the main dining room fill up two months in advance for peak times (is Saturdays and Sundays) so make sure to plan accordingly. If you are in a pinch, call the restaurant for a table in the bar area - same menu but less planning ahead needed. Bar area seating - this was packed when we were leaving around 8pm! The "Bring Me Food" style dining is the 5-course tasting menu option. You are seated near the large (and gorgeous) option kitchen area at white linen covered tables. As your courses are served the Chef comes out and personally explains the dish. There are only 7 or so tables so if you are interested make sure to call for reservations as soon as possible (no opentable.com). And for those of you who like to live on the edge, walk-in seating is available at the communal table in the Cognac room (adjacent the bar) and outside on the patio. 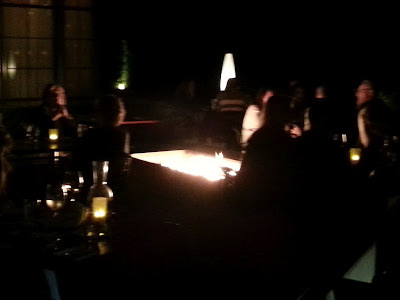 Even on a slightly chilly night like this past Saturday, the patio was packed with last minute diners and cocktailers alike. 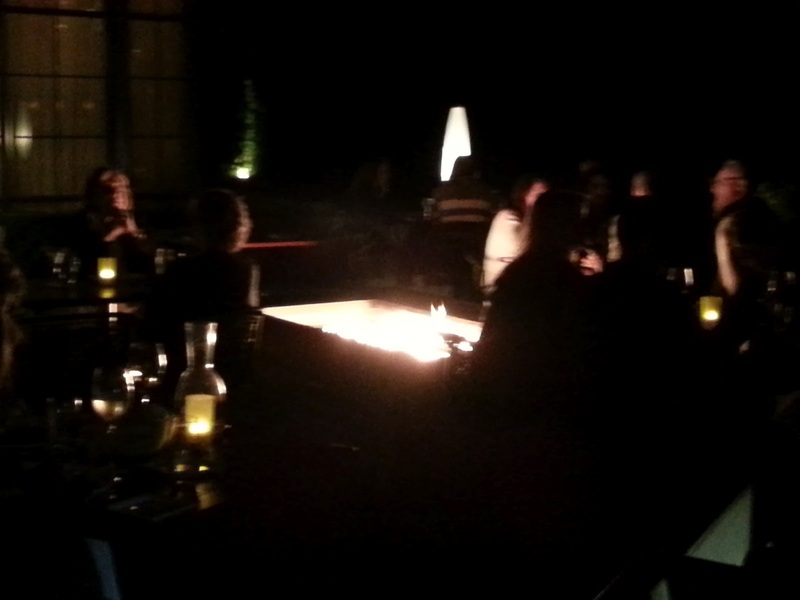 All looked to be enjoying the big fire pit in the middle of the patio. I had made reservations on opentable.com two months ago, so my mom and I were seating in the main dining room area. First order of business - mommy and me cocktail time! 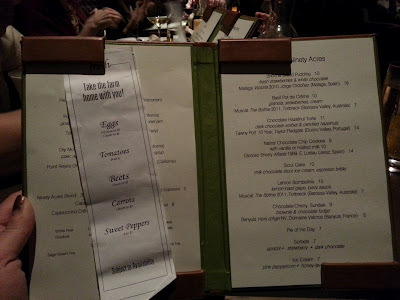 As we perused the menu, I loved that there was a wide variety of options for all sorts of diners and tastes. Similar to Blue Hill, ingredients are grown at their farm and/or sourced locally. 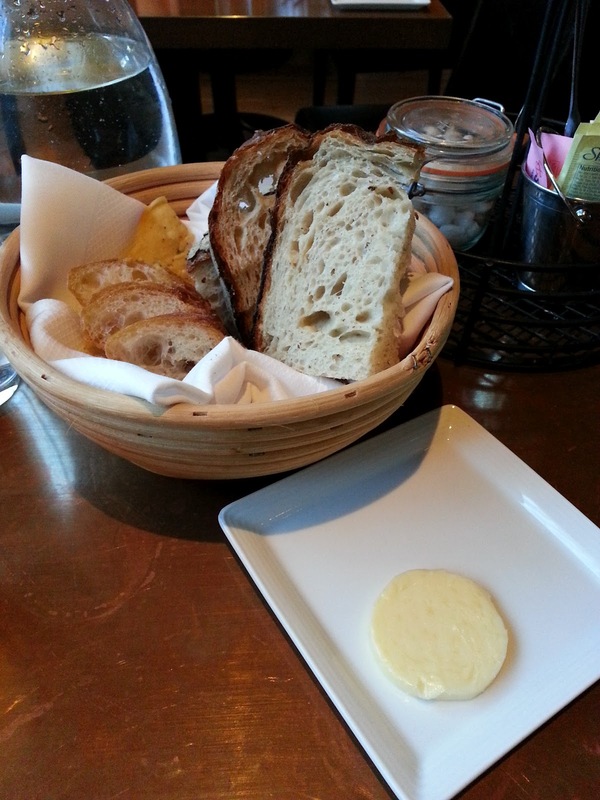 After placing our orders, the bread basket came out. You all know how I feel about bread baskets! Well, my mother is even crazier about the bread basket and pretty much dominated the contents. From the few nibbles I managed to steal, it was great fresh bread with soft butter (I will have to say the butter in no way compares to Blue Hill butter though...). Bread basket...my mother is an even bigger fan of bread than me! First up were our appetizers. I've been on a severe octopus kick lately so I couldn't resist going with the Paprika Rubbed Grilled Octopus. 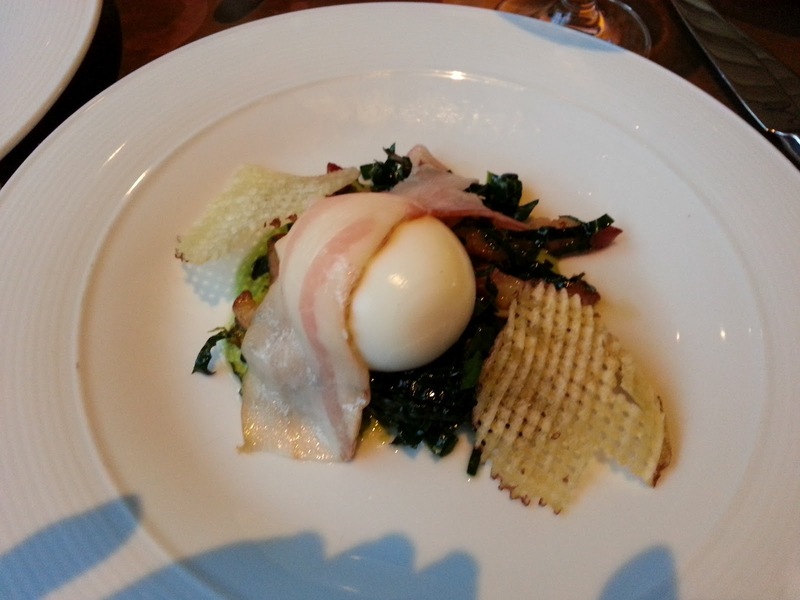 My mother went with every farm-to-table restaurant's must try: the Poached Egg. I was actually disappointed in the Paprika Rubbed Grilled Octopus. 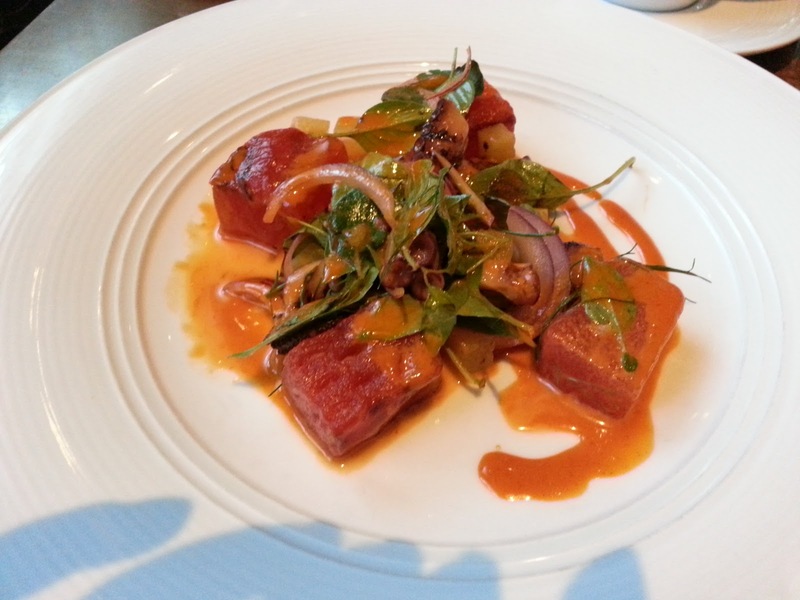 It came served with watermelon, red onions, and ancho-lime & garden herbs. The watermelon I thought was odd. I'm a HUGE watermelon junkie but I didn't like it with the octopus. In terms of the octopus itself, the texture was not what I was expecting (kind of ...mushy??) and the flavor was lost between the watermelon and sauce. The Natirar Poached Egg, however, was fantastic. If you come, this is something you need to try! It comes served with pancetta (mmmm bacon! ), fingerling crisps, kale, and red onions. The egg was sooooo good and when you break it open, the yolk mixes with the kale, onions, and pancetta and it is everything good about brunch - all in a dish at dinner! Natirar Poached Egg - excellent and must try! For our next course, we couldn't pass up the Fresh Mozzarella Pizza. 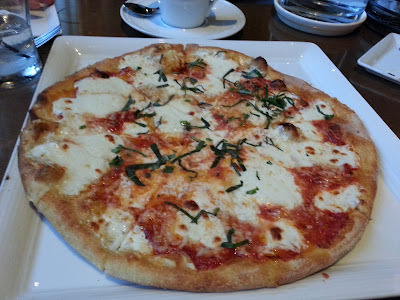 The cheese and basil were great and the tomato sauce tasted extremely fresh. My mother thought the crust could have been crispier (this crust is similar to the pizza at ABC Kitchen in that its thin crust but the middle is a touch soggy/fork and knife required), but I guess its just personal preference. I thought it was tasty! As for our mains, my mom couldn't resist the call of the Farmer's Plate special for the day - Saturday is Prime Rib night! 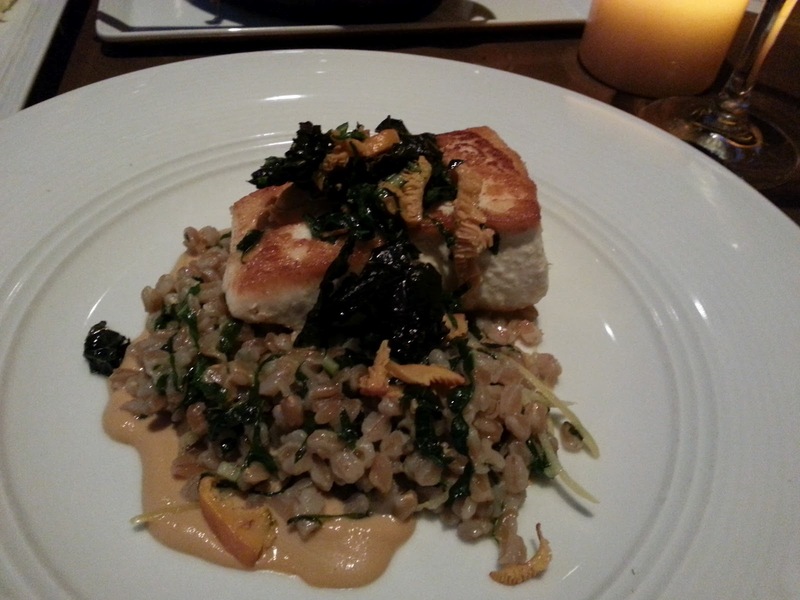 I went with the Sauteed Alaskan Halibut. We both also shared a side of the Organic Mushrooms. 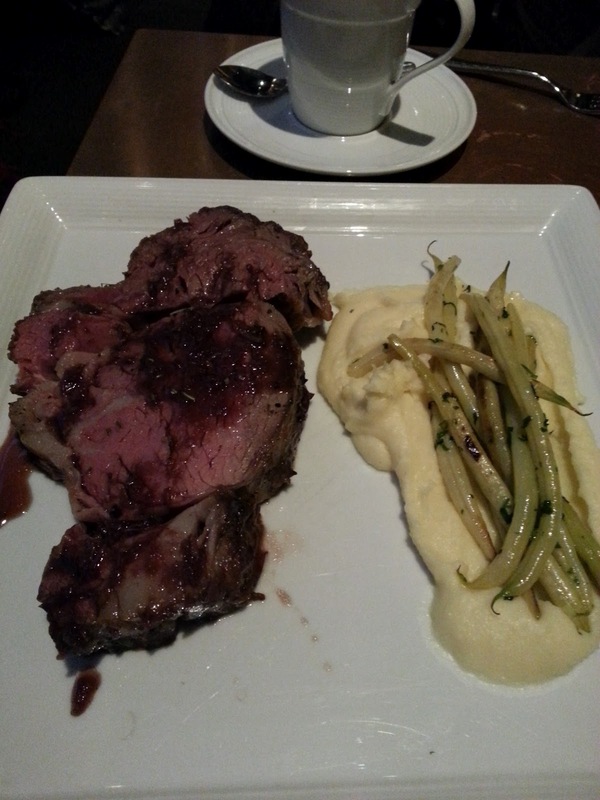 The Prime Rib was excellent - oh so tender, juicy, and flavorful. Served with mashed potatoes and haricot verts. I had trouble getting a sampling from my mom as she was busy devouring it all herself. This was excellent. The side of mushrooms was a total score. 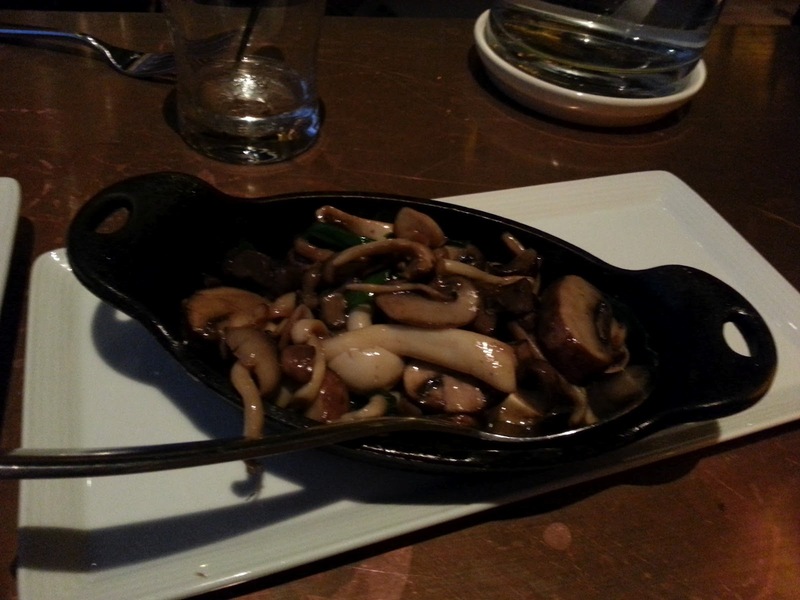 I loved the mix of various types of mushrooms and the preparation was perfection. Love! 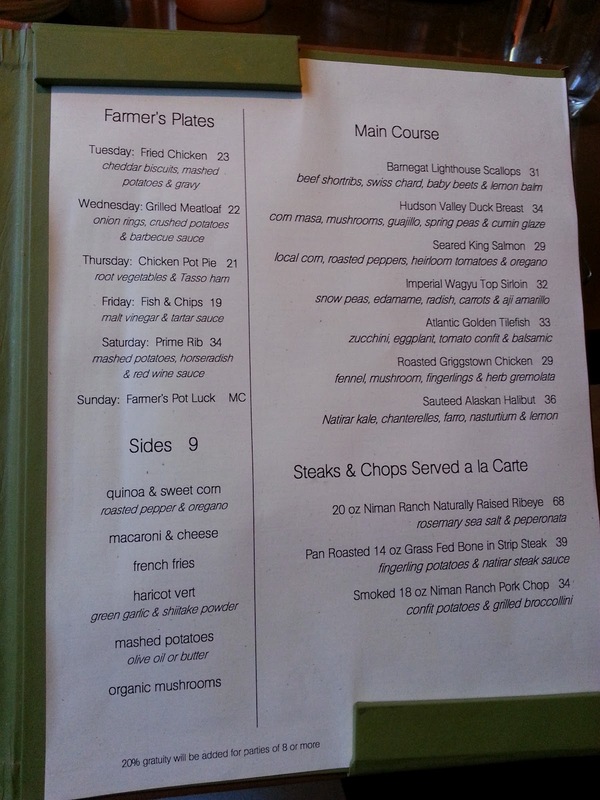 Dessert menu and list of available produce for purchase from their farm! 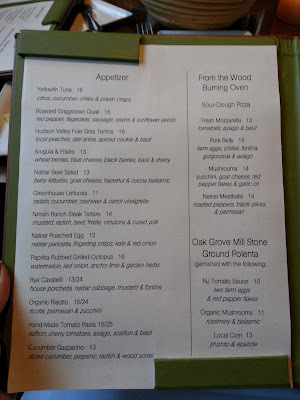 All in all, we had a great time at Ninety Acres and I'm really excited to have something this awesome so close to my mom's place. So how does it compare to Blue Hill? My mom gave Ninety Acres the nod in her book. Personally, I prefer Blue Hill just a touch more. I was disappointed in the octopus and my halibut here at Ninety Acres - at Blue Hill I was never disappointed by the execution of the food (if I was disappointed, it was usually in portion size. Ninety Acres has Blue Hill beat in this arena). But I won't judge my entire dinner experience on the fish as everything else was very well prepared and super tasty. 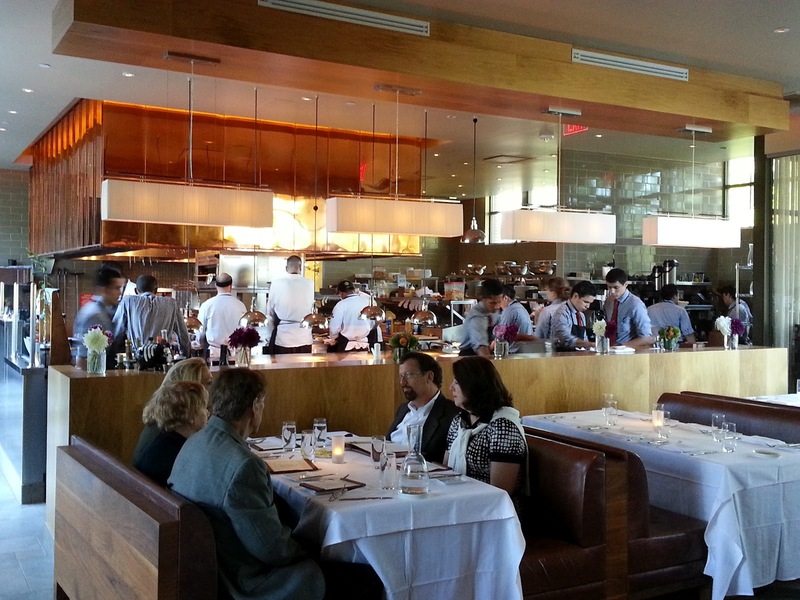 In terms of ambiance, feel, and quality of ingredients and service, Ninety Acres was on par with Blue Hill. 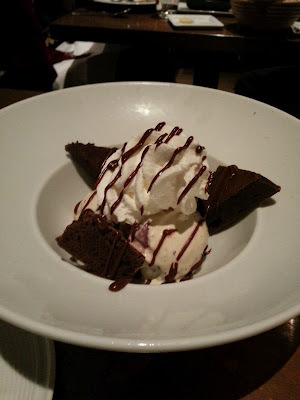 The waiters here were all attentive, knowledgeable, and extremely friendly and I loved how fresh everything tasted. 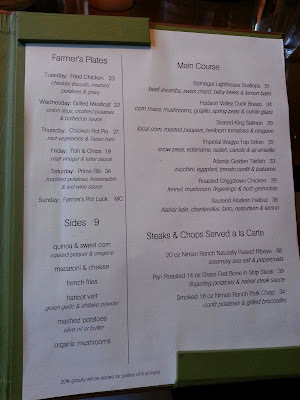 If you have the opportunity, definitely make a trip out to experience Ninety Acres. My mom liked it so much that she immediately made a reservation to come back in two weeks - maybe you'll see her there!